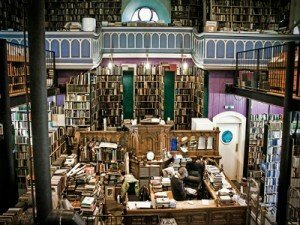 Leakey’s Bookshop and Café on Church Street in Inverness, Scotland is the best bookshop I’ve ever set foot in, and I’ve been to many. Leakey’s Bookshop and Café sells high-quality used books and delicious food. I’d never been to a second-hand book shop before I went to Leakey’s. I wasn’t interested in used books. If they were like the one used book I’d bought online, they’d be battered, they’d have torn pages with ominous pink stains from goodness knows where, and they just wouldn’t be new. They wouldn’t have a new book smell or a perfect cover. It was my friend who showed me that used books were just as good as new books. We’d met through our mutual love of writing, and I travelled down to Inverness to meet him, where he took me to one of the most amazing places in Scotland. From the outside, the place he took me to looked like a church, except for the big letters along the side of the building that said “Leakey’s.” As it turned out, Leakey’s Bookshop and Café was in an old church which had been converted into a bookshop. Inside was a massive room with a huge, warm fire in the middle. The smell of home-made food from the café upstairs was amazing, but none of it was as brilliant as the books. The sheer amount of books was what surprised me. They were everywhere. They lined the walls downstairs and upstairs. They were piled high. In some parts of the shop, they lined the floor. I loved it instantly. The variety of books inside Leakey’s was stunning. The books were in beautiful covers, and some had delicate artwork along the sides of the pages that made shapes and pictures when the book was closed. There was poetry books, scientific books, crime novels, romance novels, mystery novels, textbooks, books about religion, books about history, books about travel, books about animals, books about different languages and cultures, and a whole section of books for children and teenagers, all of which were second hand. It seemed like Leakey’s had every book you could possibly imagine. They probably do. The books for children and teenagers are the last books you find in Leakey’s, almost directly across from the entrance. There’s a whole corner of books for children and teenagers, all at easily affordable prices. To add to this, many of the books are first editions. During my visit, there were several hard cover, first editions of the Harry Potter series by J.K. Rowling and the Northern Lights series by Phillip Pullman, each selling for no more than £10. The choice of books for children and teenagers in that section alone was massive, with older and more modern books, unlike the selections of books you might find in shops like Waterstones, for example, that tend to sell books that are new releases and are popular at that moment in time. Leakey’s is Scotland’s largest second-hand book shop, established in 1979. It has been around for thirty-five years now, the last twenty of which have seen Leakey’s situated in the old Gaelic church in Church Street, Inverness. Leakey’s Bookshop and Café receives hundreds of positive, five-star reviews. There are one hundred thousand books inside Leakey’s, many of which are first editions, all of which are in near perfect condition. In addition to this, Leakey’s sells their books online. You can find Leakey’s on Facebook, where they post their daily lunch specials. Oh my gosh. I really REALLY want to go there!